Are you ready to increase morale and productivity in your office? Do you want to do it without committing much of your budget? Of course you do! The full line vending services offered by Hagerstown Canteen Service in McConnellsburg can do it. We know your employees get hungry and thirsty and productivity wanes. We bring the food and drink right to them so they stay and enjoy break time for relaxing instead of fighting traffic to rush out and back. That's why we also offer office coffee services, vending machines and water filtration. We make it easy for your employees to get what they want, when they want it. 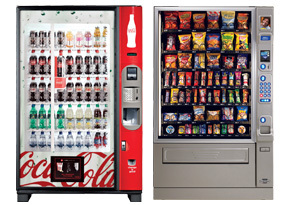 We install and maintain vending machines on your property at no cost to you! Today's vending machines offer several payment options, a huge selection of quality products, are very efficient and stylish and are extremely dependable. Our team will install them, fill them keep them filled and service them at no cost to your business. We offer three different plan options – traditional, free and subsidized. If you want even more selection and convenience for your large staff, we can install a Micro Market at your McConnellsburg location. Get your employees back up and running quickly with customized office coffee services from Hagerstown Canteen Service. Coffee services include brand new brewing equipment, name brand coffees and teas, cups, plates, filters, paper towels, Kleenex, utensils, sweeteners, creamers and everything else a fully functional break room needs. Your staff will have a fresh coffee around the clock and you'll never have to run out for supplies. Keep your employees in house and get them back to work refreshed and ready to produce. We install water filtration, ending the storage hassles and heavy lifting of traditional water bottles. Our plumbed in water filtration means you'll have all the fresh drinking water you will ever need. Let's start making your staff more productive today. Call Hagerstown Canteen Service in McConnellsburg at (301) 223-8000 or info@hagerstowncanteen.com.